In Texas, a grant deed conveys title to real property with implied covenants. By including the words "grant" or "convey," the grantor guarantees that he/she has not transferred title to the property to anyone other than the grantee, and that, at the time of transfer, the estate is free from impediments. Implied covenants carry the same legal implications as if they were explicitly stated (TEX. PROP CODE 5.023). The document must state the grantor's full name and marital status, the consideration given for the transfer, and the grantee's full name, marital status, vesting information, and mailing address. Include a complete legal description of the parcel, and recite the source of title to maintain a clear chain of title, detailing any restrictions associated with the property. The document must be signed and acknowledged by the grantor in the presence of two credible witnesses or a certified officer (TEX. PROP CODE 12.001b). Depending on the nature of the transaction, the deed might also require supporting and/or supplemental documentation. Record the completed deed, along with any additional materials, in the clerk's office of the county where the property is located. A deed is a legal document that transfers real property from one party to another. In Texas, property owners can use a grant deed to transfer real estate with implied covenants of title. By including the words "grant" or "convey," the grantor (seller) guarantees that he/she has not transferred title to the property to anyone other than the grantee (buyer), and that, at the time of legal transfer of property, the estate is free from any impediments to the transfer. Implied covenants carry the same legal implications as if they were explicitly stated (TEX. PROP CODE 5.023). A lawful grant deed includes the grantor's full name and marital status, the consideration given for the transfer, and the grantee's full name, marital status, vesting, and mailing address. Depending on the nature of the transaction, the deed might also require supporting and/or supplemental documentation. Vesting describes how the grantee holds title to the property. Generally, real property is owned in either sole ownership or in co-ownership. For Texas residential property, the primary methods for holding title in co-ownership are tenancy in common, joint tenancy, and community property (TEX. EST CODE 111.001, TEX. FAM CODE 3.003). 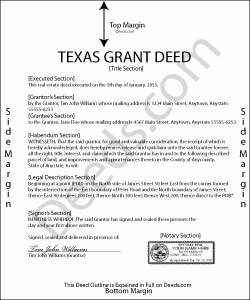 As with any conveyance of realty, a grant deed requires a complete legal description of the parcel. Recite the source of title in order to confirm a clear chain of title, and detail any restrictions associated with the property. Record the completed deed, along with any additional materials, in the clerk's office of the county where the property is located. Contact the same office to verify accepted forms of payment. In Texas, an unrecorded deed (or instrument) "is binding on a party to the instrument, on the party's heirs, and on a subsequent purchaser who does not pay a valuable consideration or who has notice of the instrument" (TEX. PROP CODE 13.001). This means that, even if a grant deed is unrecorded, it is still a binding document that applies to parties who have signed or acknowledged it. This article is provided for informational purposes only and is not a substitute for the advice of an attorney. Contact a Texas lawyer with any questions about grant deeds or other issues related to the transfer of real property.